Deadastronaut's version of the Big Muff. 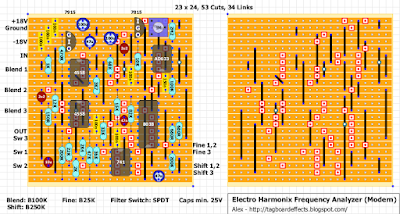 Original DIY thread and schematic are available here. There's also another great layout by Mug in the Forum section. To my ears, this is an overlooked gem. Update! Built it myself and yes it sounds as great as i remembered. However. I do recommend going stright for C10K pot on the drive control. And it doesn't hurt to up the "12K*" to 22K. This way the output level goes up to "modern sufficient". Here is something a bit different and maybe useful! It's an "effects loop buffer". 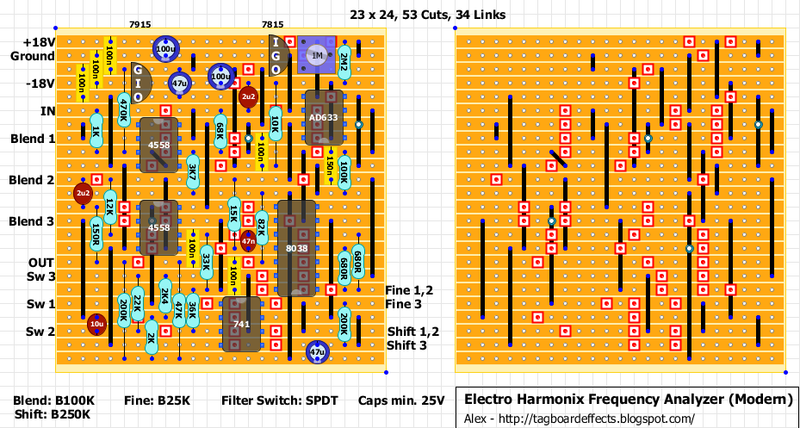 There isn't a schematic for it but you can find the original layout on Ceriatone's forum here. You can also find all infos on their original manual here. 12/03/17 Layout updated! Moved 220K resistor and link from S to G on the top J201. I know there have been veros around for a while but I wanted to add this project to the main page. It's basically a Rams Head Muff with an added Baxandall tone control. It should easily fit it in 1590B size box. 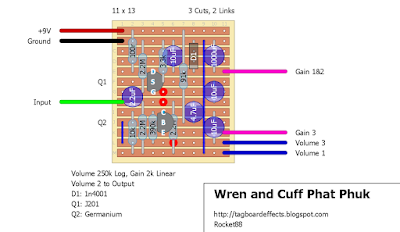 1 - I posted the trace, board pictures, and schematic in the request section, here so everyone can take a look and check the trace. 2 - the Germanium Transistor in Q2 is a Chinese Transistor with the markings removed, but what can be made out is AX9. This is PNP, but the hfe is unknown, but the good news is the schematic has been verified by JohnK, big thanks, with a PNP Germanium with 91hfe. So for now, as I put in the layout notes use a PNP Germanium with at least 90hfe, but by all means test it with other values. Don't forget that if you're using Russians that many times transistors with lower hfe seem to act similar to others of higher hfe. 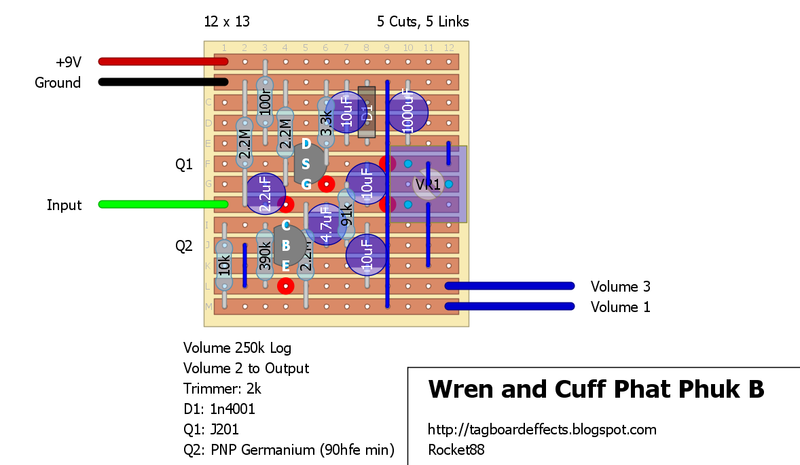 Tweaked the layout to make the bias trimmer an external pot. 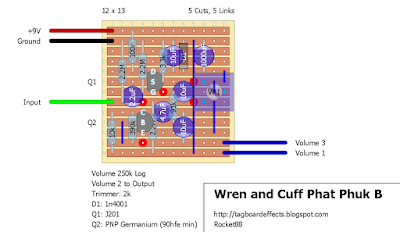 I chose a linear taper as it's common to use linear taper pots for bias adjusting and the trimmer should act linearly. JohnK used a 1k reverse log pot, but I think you won't get the full range you do with the trimmer by lowering the value. "The Germania is Homebrew's take on the classic Rangemaster treble booster from the 1960s, and offers up to 20dB of gain to drive your amp. In its 'hi-fi' setting, you get a full range boost, but a 'lo-fi' setting offers a more focused boost in one of three frequency ranges controlled with the 3Q switch. Boost in hi-fi mode is bright, with some germanium-driven grit to it, and as you turn the knob clockwise there's a massive amount available. In lo-fi mode, the three settings offer cut in the bottom but different midrange emphasis. This pedal works best with an amp that's already overdriven, and especially one that's dark-sounding - kick it in to take it up another level and squeeze out some harmonics - it did a fine job with our old non top-boost AC30. It's also great with a dirt pedal. The Germania can deliver a raw and aggressive boost, but that tonal shift won't necessarily suit all amp settings, so try it out with your own." 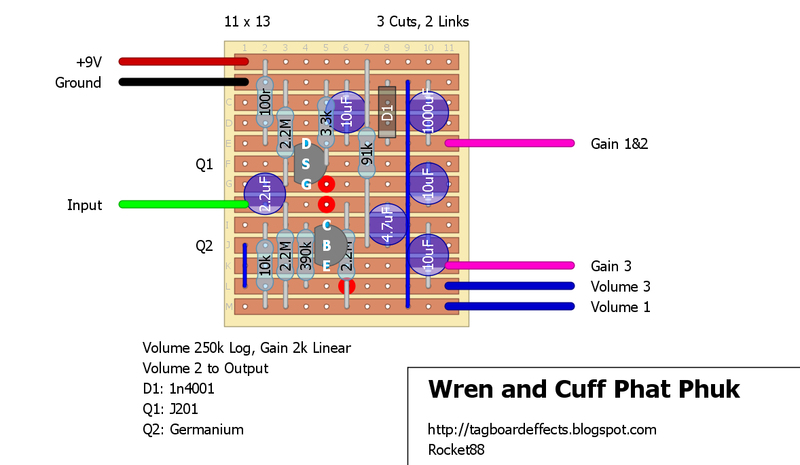 Here are two layouts for a classic Ring Modulator. The first one is for a vintage version (schematic available here). The DIP version of 1496 had a different pinout. The second one is for the modern vesion and it could potentially fit in a 125B size box (there is no schematic but a PCB layout here). Not sure if they have been verified. You should be able to use Mark's Bipolar Voltage Converter.